If you have found our Introduction to Hydro Electric Power and Guide to Pico-Hydro Power interesting, then you are should take the time to read the downloadable guide to Microhydro-electric Systems in this month’s edition of Home Power Magazine. Available free of charge as a PDF document, this guide gives a wonderful introduction to small scale generation of hydro-electricity. It is ideally suited to the DIY enthusiast as it explains all of the key concepts and pieces of equipment required clearly and concisely. 1. Intake – how to guide water from the stream or river into your system. 2. Pipeline – the different sizes and types of pipes available. 3a. Turbine – the waterwheel used to turn the generator. 4a. Controls – how to manage to the generated power and protect your batteries. 5a. Dump load – uses up excess energy rather than sending it to already charged batteries. For example a heater. 6a. Battery bank – power storage for your hydro system. 3b. Metering – track the amount of electricity being generated. 4b. Inverter – converts the DC power generated into AC power. There are also schematic diagrams to show how you can set up a grid-tied system with battery back up, or an off-grid batteryless system which uses a turbine that generates high AC voltages to be sent directly to your household for use. 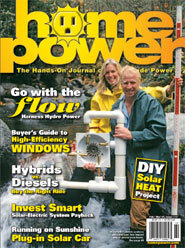 The guide can be found at the following link: Microhydro-Electric Systems Simplified (6 page PDF document) from Homepower Magazine.